My favorite is one from Carol Bartz, titled “How to Speak Your Mind,” which made me dearly miss the mind-speaking stylings of the ousted Yahoo CEO. Well known for her ability to toss off a curse like it was breathing, she knows of what she speaks. Word. 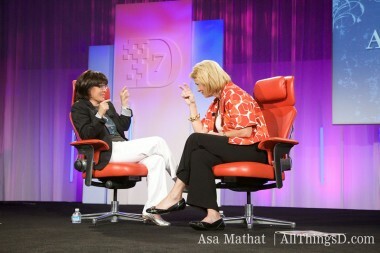 (That’s her above giving me the business at our seventh D: All Things Digital conference in 2009. If you’re going to be a straight talker, you have to believe that it’s a virtue, that it’s an attribute you want associated with yourself. If you have an opinion and you just state it, it allows the other person to either try to change your opinion, to agree with you, or to agree to disagree — they have an action they can take. If you are quiet, people think you agree. How can you then further the conversation when you’re at different points and it’s not really exposed? Agreeing is easy. Disagreeing takes more guts. Several years back, when I was CEO at Autodesk, there was a very senior-level woman who was very smart and well-spoken, but she did not wear appropriate clothes. It was distracting and she was not being taken seriously. I said to her manager, who was male, “You need to tell her.” He said, “Oh, no way.” So I called her in and frankly stated what I thought was happening. I told her, “You’re not getting the respect you deserve.” I said, “Go to Nordstrom’s and get a personal shopper. Just say, ‘I’m a senior businessperson and need help dressing like one. '” She came back, and honest to God, it was a different person. She said she felt really good. And her currency went way up. Early in my business career, if people asked me a question, I’d try to answer it honestly. And that was rewarded. I had managers who wanted me around because I would actually tell them what was happening. I was raised by my gram, and she was a pretty straight talker because she thought you could handle it. My advice is, dip your toe in. If you’re honest and truthful, what is somebody going to say, that you’re stupid because you believe something? Being honest and truthful is part of being a good friend, a good associate, and a good leader. It’s also why I know I could never be a politician.